Our season winning percentage is 49.53%. We are rounding that to 50%, and blaming the Giants and Browns. Not only do they appear to be trying not only to lose, but to make it so people never bet on them again. Because nobody will go near them, look out next week for the Giants/Browns moneyline parlay: +1250. There will be a great two-team race to the bottom for the first-round draft pick. The Browns have a 2 game advantage with 3 to play, but they're showing signs of life with Josh Gordon. Too bad he has to catch the ball from Kiser So-So. Kiser So-So is the best backhanded compliment of a nickname since Elvis "Toast" Patterson retired in 1993. 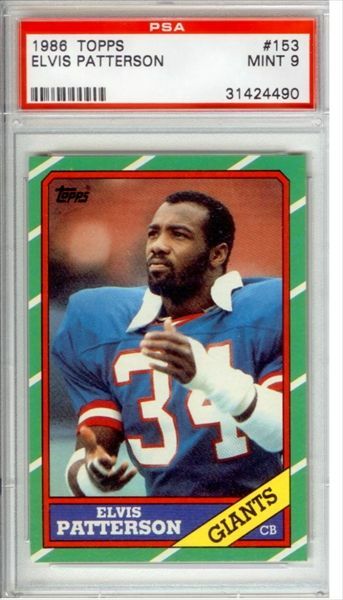 He was the anchor of a mediocre Giants secondary in the mid 80s, but we congratulate him for his 10-year career in the league. Yes, this is a Toast Patterson rookie card. In a case. Graded 9-Mint. We couldn't find the price, but if you need a Fantasy Football last place trophy, isnt this worth at least $100? But Elvis, it's time to go back to being Elvis. We're officially handing off your title of Best Backhanded Nickname to Kiser So-So. We hope he doesn't fumble the exchange.